…Which he took like a champ. The first time I gave him food, John watched over the web cam. It was pretty funny. The Munchkin was so excited to get food-food. His eyes opened wide, like “OMG THIS IS AMAZING” and he would grab for the spoon to try and get more in his mouth. I mean it you guys, he really loves the stuff. 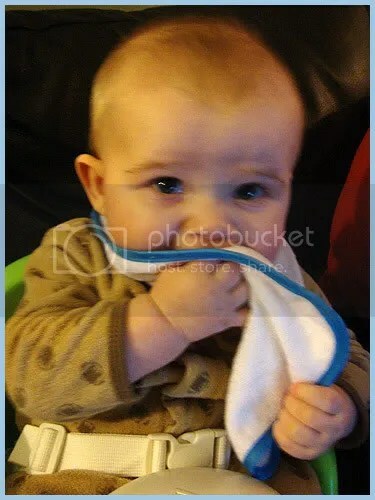 He even tried eating the mess off of his bib. Crazy! Crappy picture, but I was too busy laughing when I took it. Oddly, he doesn’t seem super full after eating the cereal, like people say babies are supposed to be. He just stops eating, and I don’t know if he is just being a piggy piggy or if the food makes him thirsty, or what, but he’ll drink an entire bottle after he eats. Weirdo. I need to learn the “all done” sign and start trying to teach him that. And maybe the “thirsty” sign, but I don’t know if he understands concepts like that yet. On Christmas, I gave him sweet potatoes. Hoo boy, I thought he was crazy about the rice cereal, but I had no idea what “crazy” meant until I gave him “flavored” food. 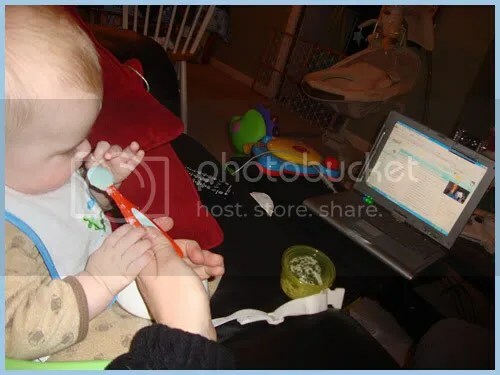 The kid literally pushes my hand so that it forces the spoon into his mouth. I cannot shovel the stuff in there fast enough. (His daddy’s patience?) He does NOT tolerate me trying to reinforce the sign for “eat” or “more” when foods are involved. “Do you want MORE to EAT, Munchkin?” “YES MOM, FOODS FOODS FOODS” is what his face reads, as he stretches his arm out towards the dish, lol. 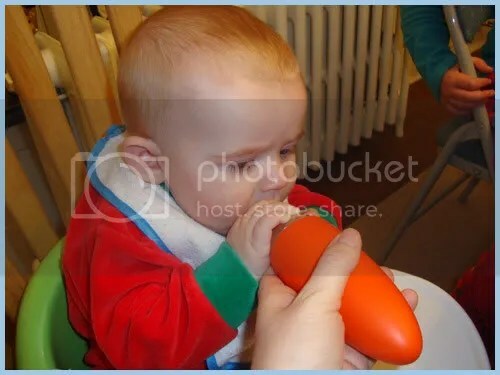 That orange spoon in the Christmas picture is awesome. I got it on clearance at Target, and you put the container’s worth of food in the end, and then you just have to squeeze the base and the food comes out on the spoon. The perfect little amount of food! So cool. My cousin was like “They didn’t have things like that when Julia was born!” Ah, technology/invention/baby things advancement. Yay food! Nom nom nom nom nom. Three months and like 40 foods later, sweet potatoes are still one of Mason’s favorite foods. It’s awesome that you guys get so much webcam time with John!! And I’ve always contemplated one of those spoons. Because man does Mason love to try to grab whatever container I’m spooning his food out of. Squishy food disaster!